EFTA EEA cannot possibly be a transitional or interim arrangement, it is far too complicated and time consuming to arrange. EFTA EEA does not address the "cliff-edge" of leaving the Customs Union (as I covered in a series of posts on my EU Question blog). The only plausible transitional deal is a "standstill", essentially an extension of existing terms which under WTO rules (GATT Article 24.5) any such interim deal is time-limited. Once Britain leaves the EU in March 2019, there is no easy way back - a fresh application (under Article 49) would be needed and would require commitment to the Euro and Schengen. Nixon also complains of British indecision and its impact on the ticking clock of Article 50 : "what is the UK proposing to transition to? 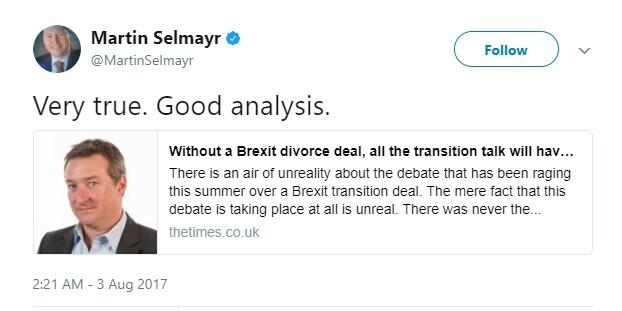 ", "Mrs May doesn’t have long to make up her mind" in choosing between an EEA-type relationship or a Free Trade Agreement (FTA). Nixon reminds us of the need for "sufficient progress ... on resolving outstanding questions over citizens’ rights" before UK and EU can start discussing their future relationship in October. Rights of EU citizens in UK: agreement was reached on 50 per cent of issues in just 3 days. Dispute resolution via a 3-judge panel (one UK, one EU, one mutually agreed neutral chairman) - proposed by David Davis in opposition to ECJ oversight - is supported by Germany and numerous EU officials. David Davis statement that "the UK has obligations to the EU" has opened the way for meaningful discussion on the so-called Brexit bill. Talks have opened on “wider separation issues” including trade in goods, Euratom, police and security cooperation. 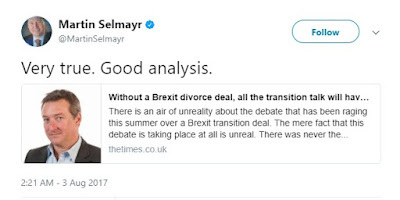 Cleppe, like Nixon, also refers to media complaints over British indecision over the future relationship and believes the choice is between the Norwegian model (EEA) and a Swiss/Canadian model (bi-lateral FTA). I find this question mark over destination surprising. May's government has consistently made clear it wants a deep & comprehensive free trade agreement and will leave the customs union and the single market. An EEA destination seems to have been ruled out. Wolfgang Munchau agrees, tweeting "Efta/EEA membership is not what Hammond is seeking. Nor is EU keen on this option. Time has moved on." Munchau's euro-intelligence blog expands on this "Theresa May could have signalled in her Article 50 letter .. that the intention of the UK is to negotiate EEA membership after Brexit. But she didn’t. And a parliamentary bill supported that position. The EU is basing its negotiating strategy on that letter." Munchau also rules out EFTA EEA as an interim in tweeting "I hate to break it to my friends in the UK, but: no, you can’t "stay in the EEA" after Brexit" and chimes with Nixon via his blog in stating that transition can only be "a continuation of the status quo minus political representation, for a time-limited period". Munchau also echoes Nixon in dismissing Remainer's hopes of a Brexit reprieve. The EU is not going to suddenly offer Britain a better deal than Cameron negotiated, especially on Freedom of Movement. The EU is more likely to add conditions to any attempt to revoke Article 50. The status quo ante has gone forever. Will the UK be able to sign new free trade agreements during transition ? If a form of customs union agreement is struck to delay the impact of customs declarations and Rules of Origin (RoO), then it follows Britain cannot implement new FTA's. But there should be no reason to prohibit Britain negotiating new FTAs during this period to come into force once new customs arrangements are ready - which may be before the end of the transition period. Will the UK be able to restrict EU immigration during transition ? This will be a difficult sell for the British government. I expect a compromise where British government will proclaim it is providing time for business to adapt via a "phased implementation" of a new immigration policy, potentially coupled with a clamp-down on benefits claimed by EU migrants. This is why for me, clarity on certain issues is so crucial: transition is time-limited; based on WTO GATT 24.5; with a destination of a looser Canadian/Swiss FTA rather than a Norwegian/EEA model. That is the best and surest way to avoid a Remain campaign for EU associate membership.